Cushion Source blends the latest visualization technology with superior customer service, allowing you the benefits of modern advancements paired with the human touch of real advice, personal experience and a dedication to translating your design dreams into a reality. We understand the uncertainty many people feel about ordering custom cushions online, and we strive to eliminate these anxieties through fabric samples, consultations with our in-house interior designers and a friendly, experienced voice on the other end of the line. Our promise to you: Double-check your dimensions, and we'll triple-check our quality. If we don't exceed your expectations, we pledge to make it right as quickly as possible. Custom means the right fit for you  the right size, the right style and the right quality. Cushion Source makes cushions in any size and nearly any shape. If the custom cushions you ordered are not the right size, we want to make it right. If the error is on our part, we will fix or replace your cushions at no cost to you. If you entered the wrong dimensions while ordering, we will work with you to get you the lowest price possible on a cut-down or reorder. Cushion Source offers hundreds of indoor and outdoor fabrics. To make sure you choose just the right fabric for your project, we offer low-cost fabric samples with fast shipping. We encourage all of our customers to order fabric samples if they aren't certain about which fabric to choose, particularly if color matching is important for the project. 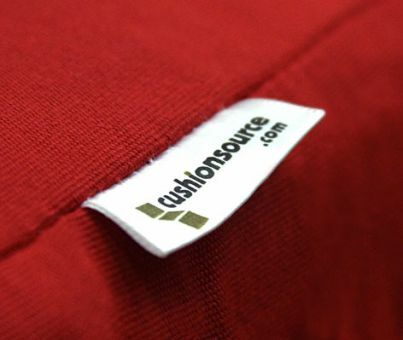 Cushion Source uses only top quality materials on our cushions, pillows, drapes and more. From high-performance fabrics like Sunbrella and an array of fill options, to the expert craftsmanship from experienced seamstresses, you won't find a better product anywhere. We placed an order with you for three window seat cushions. When they arrived, we were in the middle of renovating still, so they weren't opened for a while. When we were finally able to open the packages without fear of dust, we discovered that the buttons were not properly sewn down. I contacted [Cushion Source customer service representative] JoNiya and, despite being outside the time limit for returns, she readily agreed that I should send photographs and that she would arrange for them to be collected and redone. I travel a lot, so it took a while for me to get these to her, but she emailed to remind me that she was still waiting (whereas most people would just hope that I'd gone away). As soon as JoNiya had the photos, she emailed to say they'd be collected and reworked. Well, it took a few months because of a comedy of errors with FedEx collecting, or rather not collecting, and then losing the package in their warehouse and then redelivering it to us without it ever having been sent back to you. The list went on. However each and every time there was a problem — and usually before — JoNiya was diligently chasing up where the package was, checking on the status and attempting to get the rework job finished. You eventually remade the cushions for us and shipped them out. Although the whole saga dragged on and on, I would have absolutely no hesitation in ordering from you again. The cushions are beautifully made, and the customer service and endorsement of your product is clearly second to none. Enormous thanks to JoNiya for sticking with it — she's outstanding at her job.